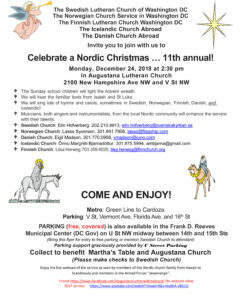 Sponsored by the Norwegian Church in Washington, D.C. Enjoy Norwegian food, open sandwiches, marzipan cake, fresh waffles, coffee and tea, solo! Saturday we will also serve warm Norwegian rice pudding with sugar, cinnamon and butter in addition to the other treats. 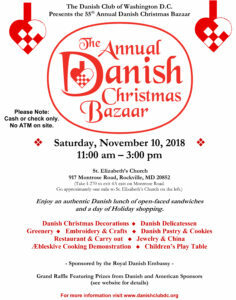 Do your holiday shopping of Christmas food, chocolate, Scandinavian Christmas gifts, Scandinavian sweaters, Rosemalings products, jewelry, ornaments, Scandinavian Christmas decorations and a lot more! Enjoy an authentic Danish luncheon in our cafe or bring home sandwiches from our carry out counter. 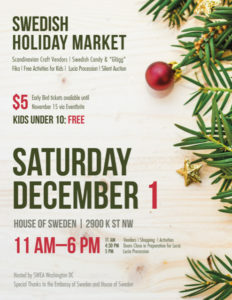 Enjoy a day of holiday shopping with aebleskive cooking demonstration and grand raffle. Come discover "The Land of Fire and Ice"
Opening by H.E. 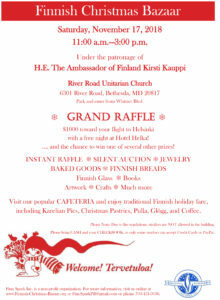 Kirsti Kauppi, Ambassador of Finland to the U.S.
For many more details, follow this link. 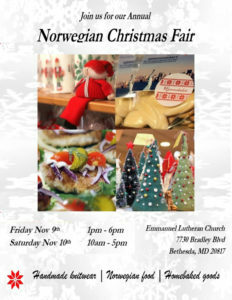 The Sons of Norway Lodge's annual Norwegian Christmas Festival is coming, and we'd love your help! 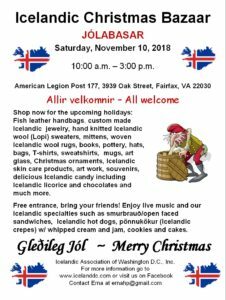 We'll have two days of live music, imported foods, lefse, krumkakker, and vaffler demos, the Nordic cafe, sweaters, jewelry, books, traditional baked goods, craft demonstrations, a family of Lundehunds, and much more! 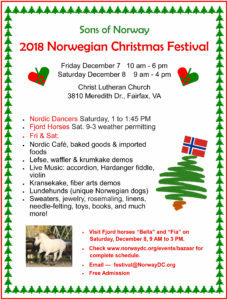 On Saturday, Dec. 8 we'll have two beautiful Norwegian Fjord horses. Volunteering for the Festival is lots of fun. We need lots of different jobs filled, large and small, and we're flexible with time. No experience needed. We really need your help! 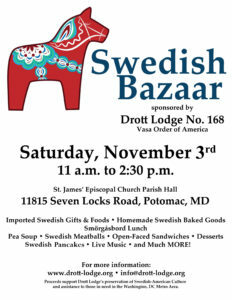 To volunteer call Marie at 703-815-3467. Non-members welcome - come learn about our Lodge! St. Lucia Participants Needed. Rehearsals will be held on three Sundays in November, from 6:00 - 8:00 pm on the 4th, 11th and 18th. Participants must be age 8 and above and need to participate in at least two of the three St. Lucia training sessions. Gowns are available. The training sessions will be held at First Trinity Lutheran Church on 4th Street NW, Washington DC. For more information, please contact Viveca Kazarian at: viveca.kazarian@gmail.com or Elisabeth Albaugh at: albaughg@comcast.net. 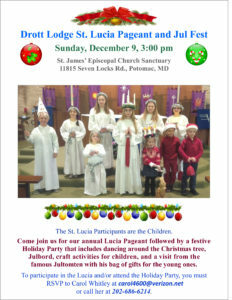 Children's St. Lucia at 3:00 PM in the Sanctuary. 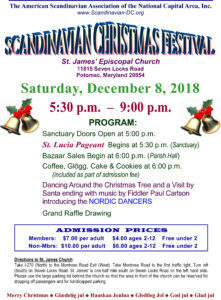 The Lucia is followed by a holiday party in the undercroft with dancing around the Christmas tree and Santa's visit with gift bags for the Children. The Sunday school children will light the Advent wreath. We will hear the familiar texts from Isaiah and St Luke. Swedish, Norwegian, Finnish, Icelandic, and Danish! instrumentalists, enhance the service with their talents. All invite you to join with us.